« Another lovely mention – thanks Waffler! I have always been fascinated with words – how we use them, how we chose which ones we use, how they change over time. And I am a copy editor and proofreader in one of my other lives, so even when I am deep into an art project, I’ve got words floating around in my brain in an abstract way. The saying “sticks and stones will break my bones but words will never harm me” has always struck me as hopeful but distinctly improbable these days, and I wanted to investigate the intimate relationship people have with descriptive words that are thrown their way. For the past year, I have been thinking about creating an interactive installation that invites participants to play with words, but didn’t quite know how to jump into such a different medium. Fortunately, Washington DC has a wonderful, occasional, festival called Artomatic, which occupies a building (usually soon to be demolished) and fills it with an unjuried frenzy of visual and performance art – the perfect place for someone like me to try out a new idea. This year, Artomatic is in Crystal City, VA (1851 S. Bell Street, about a block from the Crystal City metro stop and only a short drive out of DC). It runs from May 18 through June 23. 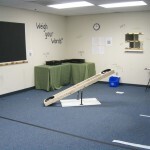 I nabbed a corner spot in a big room on the 3rd floor and turned it into a short of short-hand school space, with a black board (classroom), a seesaw (playground), mirrors with shelves (bathroom), and dish-sorting bins (cafeteria). I had compiled a list of about 700 words that people use to describe themselves and others (all adjectives and nouns; positive and negative; antiquated, common, and slang). Then I covered stones (about 1″ to 4″ in diameter – yes, about 700 of them…) with my high-shrinkage flax paper and then wrote one word on each of them and distributed them around the installation space. 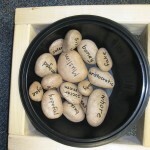 Participants are invited to play with the words/stones in a variety of ways. For more details, see the blog I have created for this installation (http://weighyourwords.wordpress.com/). It includes the word list, invites people to suggest new words (I know I have left out some crucial words), asks for stories about how people use words with each other (bullying, terms of endearment, etc. ), offers an opportunity to post poems using the words from the list or self-portraits of visitors with self-describing words on the shelves in front of the mirrors. If you are reading this while the show is still up – please come down and see it for yourself! This entry was written by beelsebub, posted on May 17, 2012 at 9:39 am, filed under Life as an artist with a life, New Work, What is Art/Craft?. Bookmark the permalink. Follow any comments here with the RSS feed for this post. Post a comment or leave a trackback: Trackback URL.